Sorry, old sport. The great American novel about pursuing the great American dream is still yearning for a tryst with the great American movie. Jay Gatsby was a self-made man, picking himself up by his proverbial bootstraps on more than one occasion, and he made a fortune in the process. More significantly, he made his fortune in the name of love, driven by the desire to provide the highest quality of life for the woman who took his breath away. It’s been my observation during my own personal history that no man has achieved greatness without at least a dab of controversy. Gatsby is no exception to that rule. Even the title of his story, The Great Gatsby, is subject to debate. Was Nick Carraway being facetious or serious in reference to his sometime friend, Jay Gatsby? Was Gatsby emblematic of high society’s ills or was he a victim of them? Gatsby is today as he was then, a divisive figure. Some people are unmoved by his story. Others can’t stand the guy. Still others are resentful of having been forced to read his story as part of their schoolwork. Indeed, there’s hardly a worse fate for a work of art than to force it upon uninterested parties. As for me, I probably would’ve been one of the uninvited guests at Gatsby’s parties, had I been around back in the day. Looking on, absorbing, observing, but keeping a safe distance. As outwardly beautiful as those gathering at Gatsby’s Long Island mansion were, beneath their well-tended skin many of them were a different beast. Gatsby’s tale reveals the unscrupulous nature of a certain section of society. His was an empty, solitary end; sadly, a similar disenfranchisement befell F. Scott Fitzgerald, Gatsby’s chronicler by way of Nick Carraway. Gatsby’s parties, oddly enough, remind me of U2’s Elevation tour several years back. The location was that modern-day Babylon known as The Meadowlands of New Jersey. I was there, among the enthusiastic fanatical few hundred who could fit down in that fantastic heart-shaped pit; of course Bono was there on stage, and Baz Luhrmann, whom Bono acknowledged during the show, was also there. I think he was in an arena suite, looking down on us all like Jay Gatsby looking down on the throngs of partygoers from his porch. The three of us - Bono, Baz, and Mattopia Jones - see eye to eye on many of life’s biggest concepts: truth, beauty, freedom, love - and that a life lived in fear is a life half lived. If you’ve seen Moulin Rouge! you know the drill. 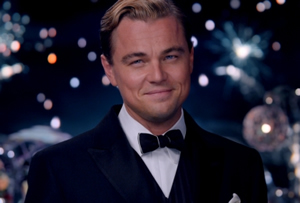 It’s easy to see the attraction a story like Gatsby’s would have for a man like Baz. Jay’s love for Daisy was over the top, the kind of wildly obssessive love that fits in with Baz’s ouevre of heart-on-your-sleeve Love with a capital “L.” It’s the Technicolor love of Moulin Rouge! and Romeo + Juliet. Baz even took this vision to Broadway with his spin on Puccini’s La Boheme. But all is not well in Bazmania. This Gatsby, like the four other filmed versions that preceded it (most notably, one in 1974 starring Robert Redford working with a screenplay by Francis Ford Coppola), is every bit as fatally flawed as the titular character. The narrative is sufficiently faithful to the source material, aside from a couple really big alterations - including an added layer of complexity which puts Nick Carraway in a monumental therapy session that yields his book. But, thanks to a conflict of styles and influences, this particular rendition feels an awful lot like Moulin Rouge! Part Deux. The conceit behind Moulin Rouge!, using contemporary pop and rock music to capture the excitement felt by Parisians in the early 20th century as they soaked up a lusty Bohemian lifestyle, worked well. It was an entirely original work, a wholly unique vision. That approach is used here, with executive producer Jay-Z supplying new music to capture the excitement of the jazz age in New York City, but it doesn’t work nearly as well. There’s the typically eclectic mix of modern songs, including a few measures from Jack White’s cover of U2’s Love Is Blindness during one particularly significant scene, but the music feels forced. There’s an odd vibe that you had to be a part of the production team in order to appreciate the energy that’s supposed to be generated by the musical selections; the songs are, with only a couple exceptions, cut down to short excerpts in order to fit in with the perpetually moving narrative. Moulin Rouge! worked as well as it did in large part because it was a full-blown musical that allowed the music to breathe and work its magic. In The Great Gatsby the prose is the star. The collection of words Fitzgerald put together is the diva Luhrmann and co-screenwriter Craig Pearce, who co-wrote Moulin Rouge!, attempt to wrangle. Fitzgerald’s words are quoted liberally in previous versions and this edition takes things one step further - and into the third dimension. Yes, Fitzgerald’s text is put on screen, in 3-D! But, aside from those moments of creative flourish and scenes featuring Luhrmann’s trademark swooping aerial shots and hyperkinetic editing, the 3-D falls flat. From a strictly creative point of view, Luhrmann’s Gatsby is far and away the most successful film adapatation so far. While that’s high praise set against a low benchmark, in all fairness it is much more enjoyable to watch than the bizarrely wrought ’70s version. Even as the 3-D fails to impress, the attractive cast supplies the eye candy by the bushel. And a nod goes out to DiCaprio for gamely fleshing out a challenging role as he works through the complexities and enigmatic qualities of the great Jay Gatsby.